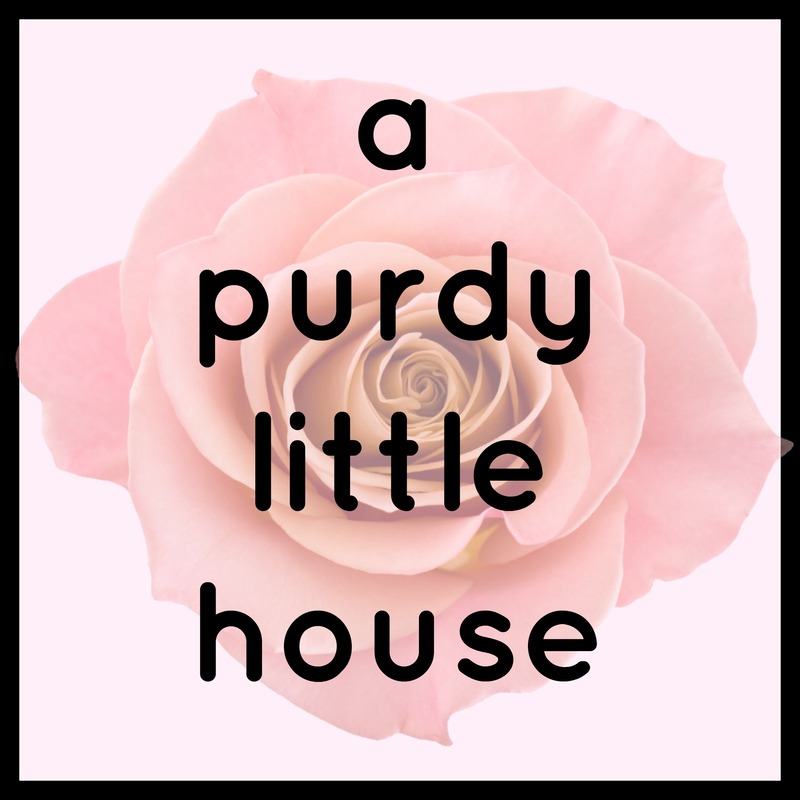 and Sue from A Purdy Little House. We invite you all to join our challenges each month where a different project/theme is highlighted, and we cheer each other on through the DIY Forum Facebook Page. 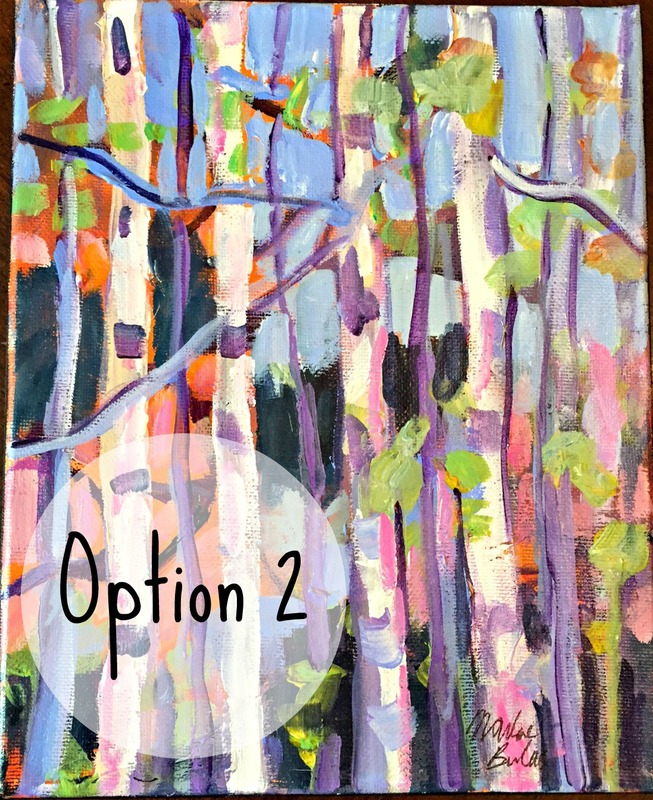 Our April #30DayFlip participants completed some truly amazing pieces of art last month, and I’m so excited to share them with you. 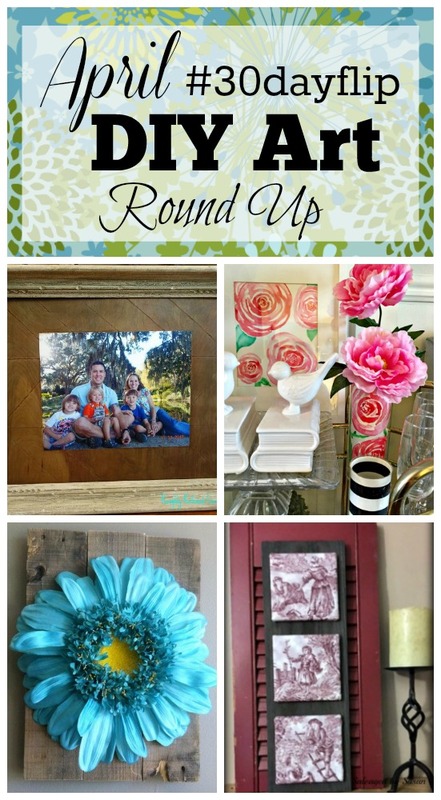 Our winner of the April #30dayflip DIY Art Challenge is Sue from A Purdy Little House blog (hey, that’s me!!). For my project, I created some Spring inspired art using watercolours, and used them in vases and in a frame to create this pretty vignette. SUE’S PROJECT SUMMARY: Let me tell you, watercolours are hard. The colours sort of bleed into each other and that can be tricky, but that’s what also makes them so beautiful when they dry. I played around with painting roses until I got the look I was going for. I would recommend a heavy paper for this, since the paint is quite wet and regular paper would wrinkle. Christina from Roughly Refined Furniture continues to dazzle us with her amazing creations and chevron inspired pieces. 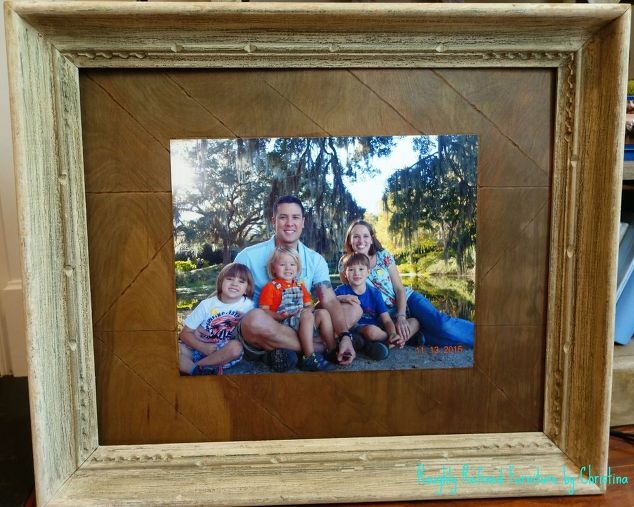 I love how this gorgeous family photo turned out with its rustic and beautiful matting. CHRISTINA’S PROJECT SUMMARY: I wanted a large family picture in one of them, but I could not find a print to canvas that was the right size. I brainstormed and FINALLY came up with an idea. I love Chevron print so I wanted to incorporate that….. 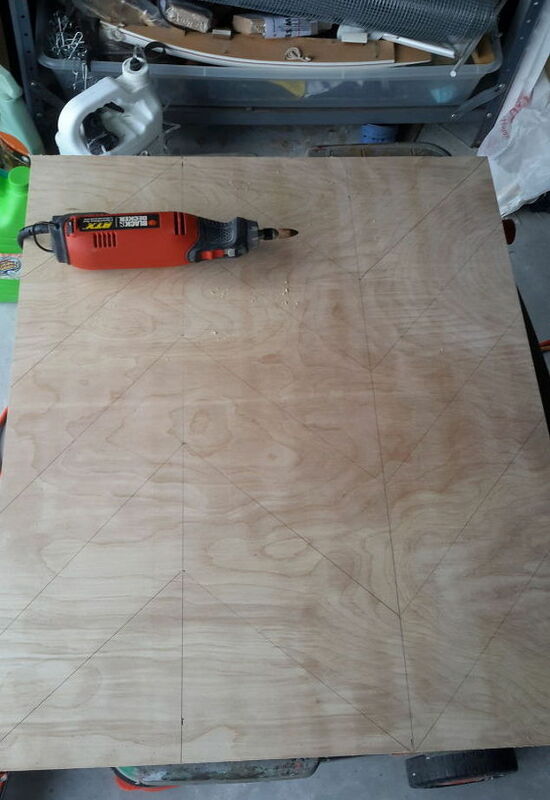 So I had a lot of 1/4 inch plywood, so I cut it to fit the frame. I drew on my chevron print and used my dremel tool to carve out the lines. 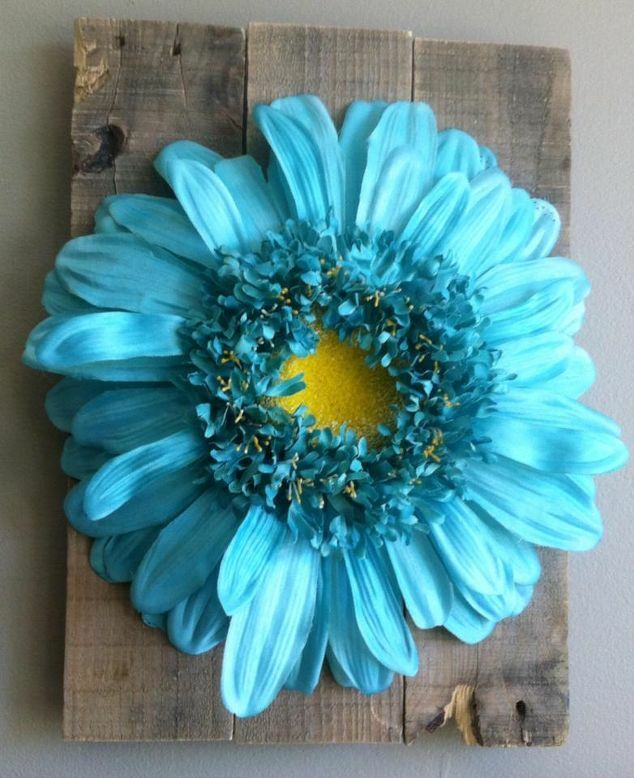 Cathie from the DIY Forum and Present-ations combined faux flowers with weathered pallets to create a lovely and unique piece of wall art that can be hung indoors or outdoors. I want to go make one of these right now. 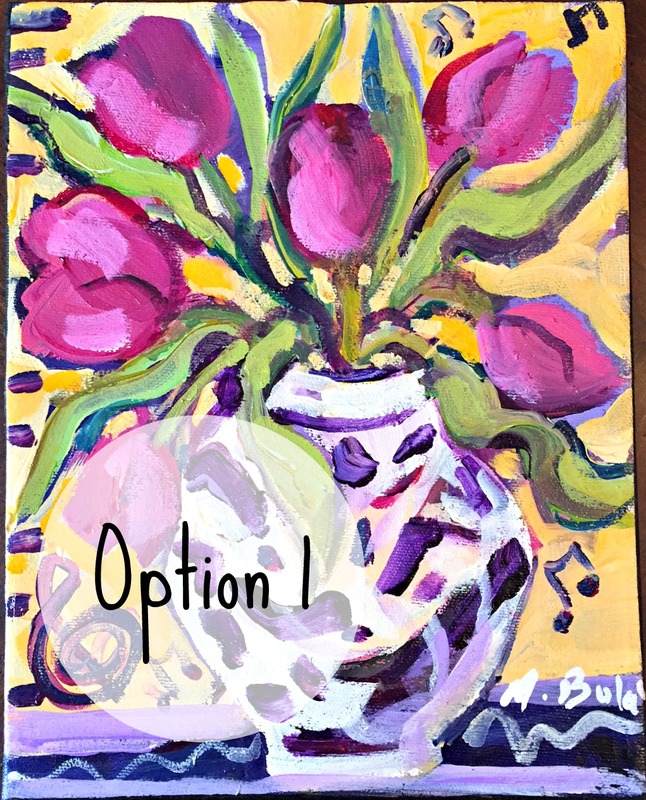 CATHIE’S PROJECT SUMMARY: I was looking for a quick, pretty way to brighten up the walls for Spring. 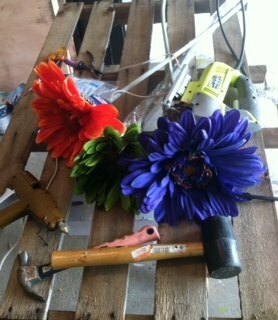 We have a stash of old pallets and I found some over sized daisy-type flowers at our local craft supply store, so I decided to put them together. 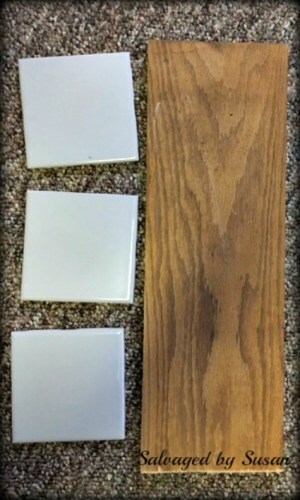 Susan from the blog Salvaged by Susan created this super sweet DIY Art project using an old shutter, a piece of wood, some square ceramic tiles, and toile fabric. It’s so cute and I love that it can be so easily customized to match any decor. 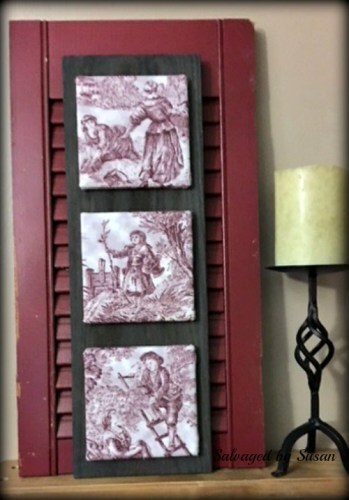 SUSAN’S PROJECT SUMMARY: I have had an ongoing love affair with toile…I fell in love with it the first time I saw it. I also have a thing for red. Given that, it struck me as odd that I have absolutely nothing in my house that speaks of that love…until now. 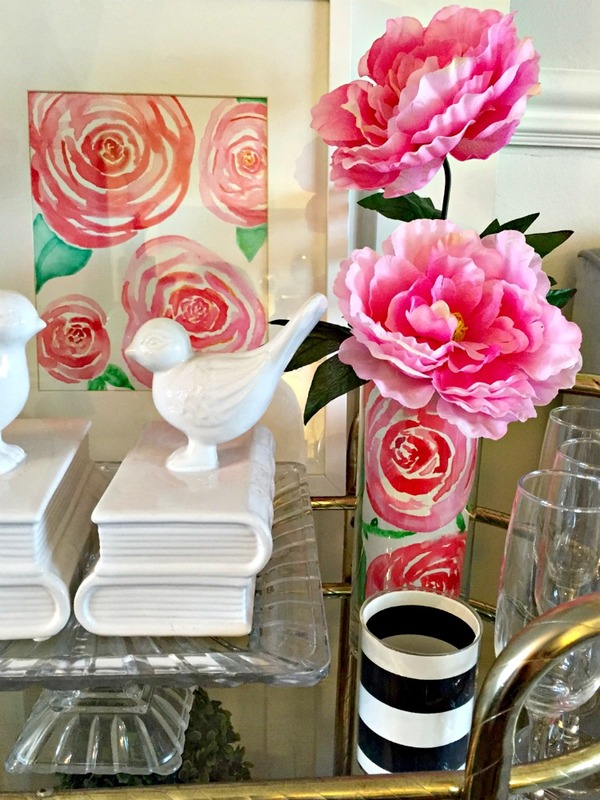 To check out Susan’s full project post click here ——–> DIY Toile Wall Art. I would like to thank all the wonderful members of the DIY Forum and the #30dayflip who participated in the April DIY Art Challenge. 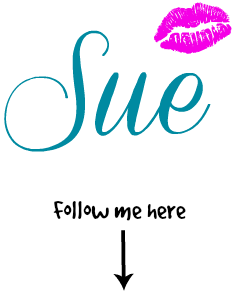 If you haven’t yet joined the DIY Forum on Facebook, and you love DIY, furniture makeovers, crafts, full room makeovers and gathering with like-minded people, just click below to request to join. We hope to also see you in the DIY Forum. This forum is open to anyone enthusiastic about DIY, creatives, bloggers, and you don’t have to participate in the #30dayflip to be a member of the DIY Forum (but we’d love it if you did). There are A LOT of new and exciting things we’re doing this year, including LIVE broadcasts on Periscope and Facebook Live where we will review our progress on the monthly flips, as well as Giveaways, support, advice from other members…… and more. 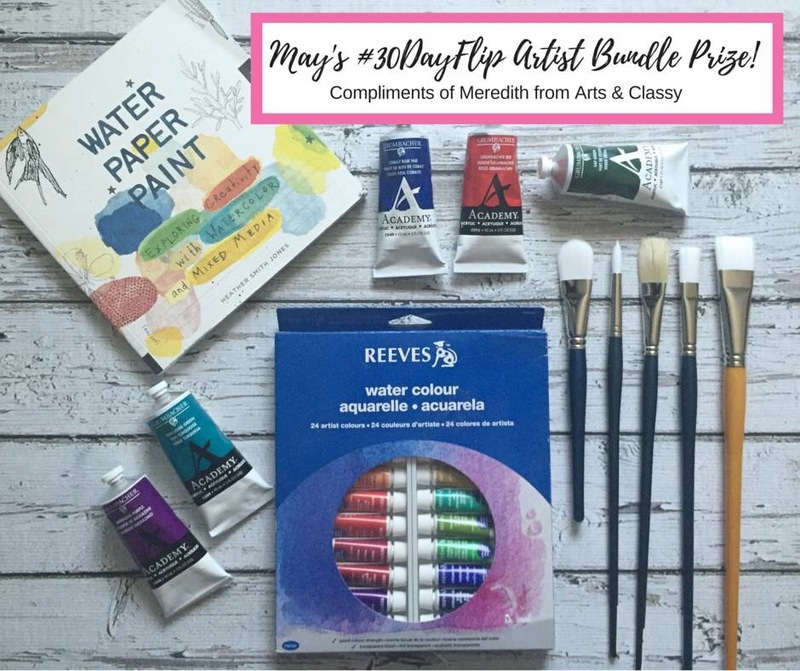 Prize for the Winner of the May “OUTDOOR FLIP” (decks, porches, flowerbeds) Challenge is a fabulous artists bundle, sponsored by Meredith from Arts and Classy. Be sure to join us for the next challenge, where you can strut your DIY skills and transform any outdoor space, whether it’s an entire deck or patio or simply adding a pop of colour to a pretty container garden; it’s totally up to you. Don’t forget to use the #30dayflip hashtag for a chance to be featured on all three of our blogs.